MANAGEMENT (continued from page 36) well your company prices are set, how well your sales team follows their pricing guidelines, and how effi cient your instal- lation crews can perform the work set before them. If your margin isn't close to the market then don't just say "Well, my market is different and I can't do that." That's the wrong thought process. Dealer-FIT numbers give you the aver- age for our industry and even break it down by size of your company. It is still surprising how similar our companies are and how similar the garage door industry is across the country. For me, Dealer-FIT data gives me a benchmark performance measure that I need to surpass to be a great company. The data isn't going to show you how to do that, but it will give you a starting point. It is up to each individual company to determine how to crack that nut. As I look at The Green Book, IDA Dealer Fit 2011, Executive Summary, on line #55, the dealers in Group 1 through 6, where "management does formal busi- ness planning," the percentages range from 34.1 to 87.5%. We currently have approximately 250 dealers participating in Dealer-FIT and that would represent 15% of the association's dealer member- ship. That is consistent with the remarks from the industry members that said they have about 15% of their customers who do an annual business plan. Is it fair then to suggest that those companies who do an annual planning session, and use IDA Dealer-FIT to assist, may perform at a higher level in their marketplace? Or, at least have an advantage to develop a targeted strategy? So why bother with Dealer-FIT? Well, for one, it's confi dential and FREE to IDA dealer members who participate. To do so requires a couple of hours fi lling out a survey that can be done online. You will need an income statement and a balance sheet that can be mailed, faxed The 2012 Edition of IDA's Dealer-FIT Survey will be mailed to participants on August 28, 2012. The Dealer-FIT Report this year is interesting from several standpoints: • Sales, net profi t and EBITDA (Earnings Before Interest, Taxes, Depreciation & Amortization) for dealers with sales under $1,200,000 in sales were lower than last year. Gross profi t fell indicating small dealers are cutting prices to secure jobs. • Larger dealers with sales volumes of $6,000,000 or more increased sales, gross margin, net profi t and EBITDA. With increased sales, these fi rms, for the most part, increased their market share. When a dealer increases market share, by defi nition increased share means that business was taken away from less successful fi rms. • Smaller dealers (those with sales below $1,200,000) have little or no formal sales force, with the owner as the only "salesperson" in the fi rm. These dealerships rely on the orders to come in via the phone, or in other words, for the customer to come to the dealer. In this "new economy" where retrofi t sales have replaced builder sales, dealerships must be structured to go to the customer, rather than relying on the customer to come to the dealer. This is a critical structural change in the way dealers must go to market today. It would appear smaller dealers have not made this change and it continues to represent a costly opportunity loss for these smaller fi rms. 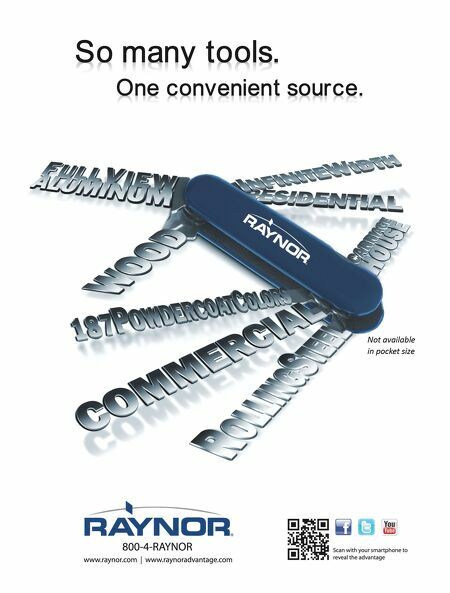 38 International Door & Operator Industry™ or sent electronically. If you do not have a fi nancial statement, you need to get one. It is crucial for your business as well as the business planning session and to participate in Dealer-FIT. The benefi ts of doing these things are numerous. It will help you focus your efforts and resources of time, equipment and money. It will assist you to analyze performance of sales personnel and installers. It will allow you to determine how much resources will be necessary to achieve your goals. And, it may guide the way to a more profi table organization. For my part, I will suggest to the IDA leadership that we develop workshops to assist in business planning and how Dealer-FIT can be made a part of the process. Feel free to contact me with your ideas and questions…I'd really like to hear from you. 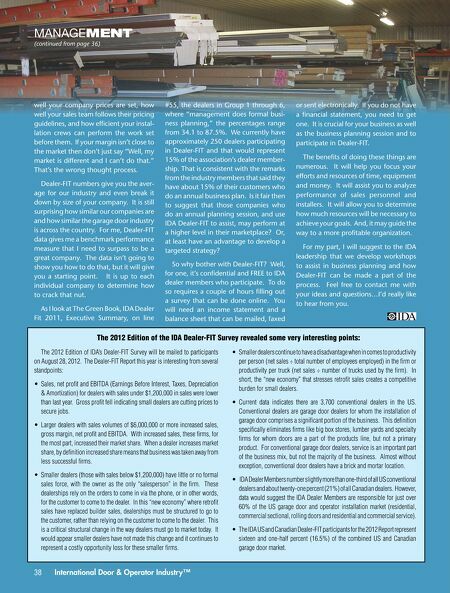 The 2012 Edition of the IDA Dealer-FIT Survey revealed some very interesting points: • Smaller dealers continue to have a disadvantage when in comes to productivity per person (net sales ÷ total number of employees employed) in the fi rm or productivity per truck (net sales ÷ number of trucks used by the fi rm). In short, the "new economy" that stresses retrofi t sales creates a competitive burden for small dealers. • Current data indicates there are 3,700 conventional dealers in the US. Conventional dealers are garage door dealers for whom the installation of garage door comprises a signifi cant portion of the business. This defi nition specifi cally eliminates fi rms like big box stores, lumber yards and specialty fi rms for whom doors are a part of the products line, but not a primary product. For conventional garage door dealers, service is an important part of the business mix, but not the majority of the business. Almost without exception, conventional door dealers have a brick and mortar location. • IDA Dealer Members number slightly more than one-third of all US conventional dealers and about twenty-one percent (21%) of all Canadian dealers. However, data would suggest the IDA Dealer Members are responsible for just over 60% of the US garage door and operator installation market (residential, commercial sectional, rolling doors and residential and commercial service). • The IDA US and Canadian Dealer-FIT participants for the 2012 Report represent sixteen and one-half percent (16.5%) of the combined US and Canadian garage door market.